I’ve recently checked my earnings on my Google AdSense account and it seems that few more months to go, I’ll be able to make a withdrawal again! So it looks like that I get to claim at least $100 a year, which is from AdSense alone. I know, I know. It’s not much for a year, but it’s a passive and effortless income. All I have to do is put up the ads on my blogs, create or write a post that targets niche and topics with bigger amount of pay per click, update the blog (at least once a month, to one of my blogs I update it every week since I have a lot to say on that niche). Yes, it’s just all that. The good thing about having a blog and in a niche that you can have something real to speak and share about is that, it becomes effortless to write. Though I know sometimes and some of you can relate that it’s tiring, but if you really want to speak out, then write. You don’t speak to one person, you speak to a lot of people not just near in your area, but also to people from all over the world. Share your thoughts, speak to them like you would talk to your close friend – but please don’t talk about things that are too personal. That’s what I usually do when I write, regardless if it is in a wrong grammar, just like how you read this post right now. One of the questions that most of my readers and followers (even on Instagram) ask me, how do I do that? How do I decide what to write about, what words to use, what topic and of course what ads size? I won’t say that this is just for Google AdSense, but I think it can work if it’s for direct advertisers for your blog. You see, there’s an ideal ads size for you to use on your site. Why? Because these advertisers have that as a standard size, and not all advertisers make an effort or want to use the small ads size. So the following sizes are now starting to be the standard ads size. It’s what they call the medium rectangle, and most of the advertisers have this size which means that there will be more advertisers to display if you use it and enable the text and image ad display. And it seems that it also performs very well if you put it up inside an article or below the article, which what I am dong. I think a lot of advertisers do have this size for their ads because most of our sidebar size is around 300 pixels. So the ad can totally fit in our sidebar! It has similar performance to 300x250 but it’s a bit bigger, plus there are also advertisers that use and have this size for their ads. The leaderboard! That’s what they call this size. I really wanted to use this but because it’s too huge for the site, I can’t use it. We’ll, it can work but if there’s an image displayed, there’s a part that it’s cut out. The wide skyscraper is wider than the skyscraper ad (size 120x600), this one is just 40 pixels wider. I think most of the blogs and sites with three (3) or more sidebar or columns use this ad size. I don’t like using it on my blogs, but they do say that it works well. It’s best to just stick with the ad sizes above, since they’re actually the top performing ads size. So that means more money for you! 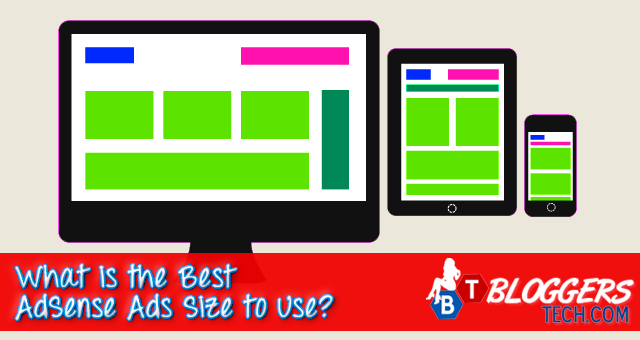 But if you want to know your other options, you may check out the Guide to Ad Sizes by Google AdSense. As for a better and deeper explanation why you should use the ad sizes above, here’s a video from Google AdSense themselves sharing the tip!